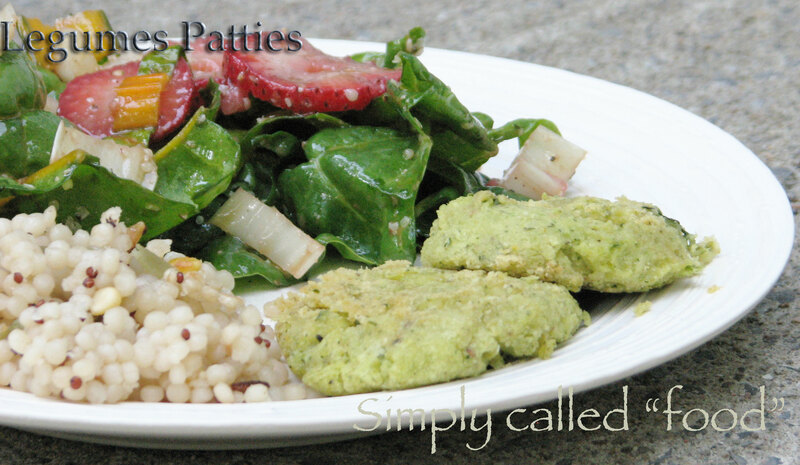 Legumes Patties | Simply called "Food"
It is sometime hard to make the others feel like they eat a different meal every day, but in fact they are having the same thing. :-) So I have to work on the flavour of the legumes, one of my daughter doesn’t really like the texture so it really has to taste good so she eats it. A great way to add flavour is to work with fresh herbs and I usually use a lot of it, not just a few leaves. I know the green is not the most attractive, but it is very tasty. I used basil and coriander, but whatever you like can be used. You should not hesitate by mixing herbs together, it makes a difference. In a food processor, combine all the ingredients and pulse until you get a smooth texture. Make small patties, it will be easier to manipulate. In a pan with oil over medium heat, cook the patties approx. 2 minutes each side. Put them on a cookie sheet and finish the cooking in the oven for 15 minutes. Serve them with any side dish and there goes you alternative to meat. Tags: Chickpea, Gluten free, Herbs, Legumes, Vegan, Vegetarian. Bookmark the permalink.